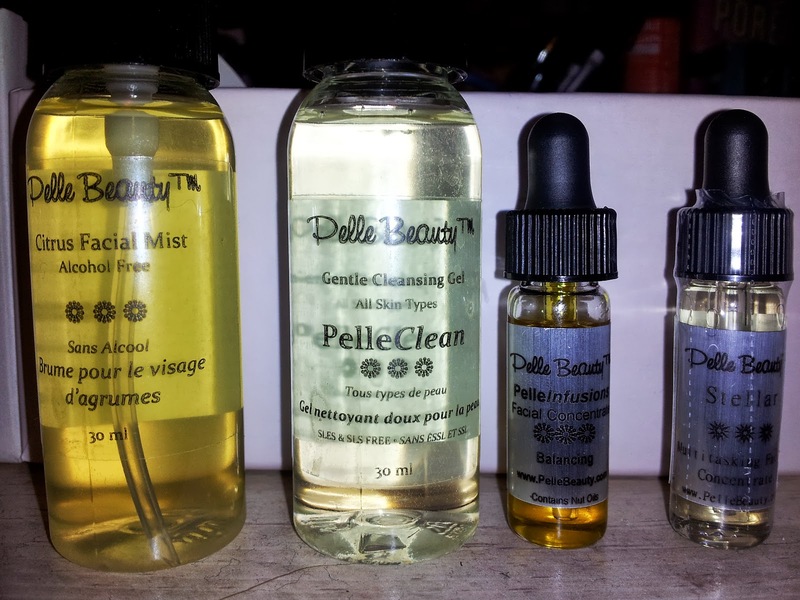 Pelle Beauty is a beauty care line that takes what we put on our skin very seriously. Our skin absorbs a lot more then we can imagine and so what we apply everyday does matter. Pelle Beauty is vegan friendly and free of parabens and mineral oils. Citrus Facial Mist: This toner is alcohol free so it does not dry out your skin. Instead, it refreshes and hydrates. It is formulated with plant extracts and essential oils. I used this after cleansing and it was gentle. It didn't burn or tighten my skin after uses. It can also be used as a makeup setter. PelleClean Gentle Cleansing Gel: This cleanser is great for sensitive skin. Its not harsh and I found it really relaxing to use. It is also good at removing any water based cosmetics. There are no sulphates. It is also free of synthetic dyes or fragrances. Just apply to a wet face, massage and rinse with warm water. PelleInfusions Facial Concentrate Balancing: This little guy has double duty; its a facial oil and serum. After cleansing, I left my face a little damp and added a few drops and gave myself a little facial massage. Why use this? It is all the moisturizer you need down to its simplest, purest form. No lotions or emulsifiers needed here! The essential oils and plant extracts will deliver the nourishment your skin needs. This is also great for all skin types. Stellar Multitasking Facial Concentrate: A small bottle, a bunch of uses! There are 5 different uses listed on the product page and a hint that there are still more to be discovered! Stellar is a light weight facial oil concentrate. It is formulated essential fatty acids and antioxidants; meadowfoam, babassu, black current, neroli, sandalwood essential oils and many more. It is a light weight weight moisturizer. It can be used as a makeup remover pre-wash. It makes an excellent makeup primer and facial mask primer. It can also be used to groom and condition your eyebrows. I also was brave and added some to my hair and I am loving the smell. I definitely am glad to have discovered Stellar! Visit the Pelle Beauty website as there are more products for all kinds of skin types. I was sent these products for review purposes. The thoughts and opinions expressed are mine own. These all sound lovely, especially the Facial Concentrate - gotta love a multitasker!